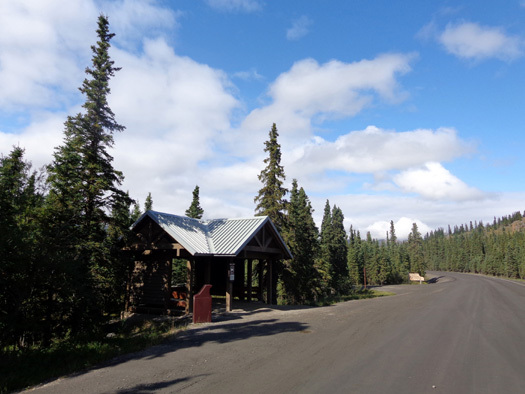 TEKLANIKA RIVER CAMPGROUND AKA "TEK"
stay and your vehicle must stay in your campsite for the duration of your stay." 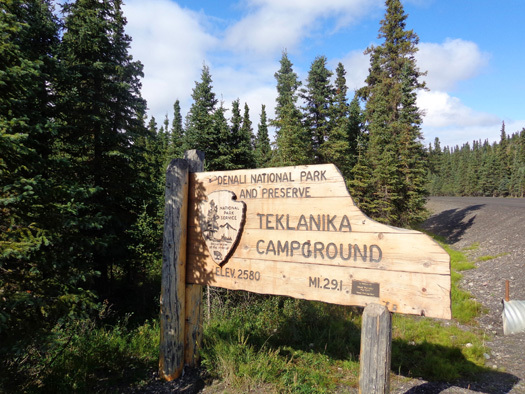 This morning we moved to Teklanika (teck-la-NEE-ka) River AKA �Tek� campground at MP 29 on the road inside the park. Fortunately all went well and none of the things occurred that Jim thought might go wrong. It was nice to wake up at 6:45 AM and see some blue sky! 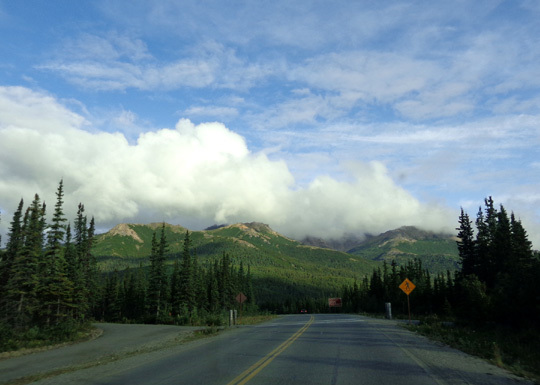 Although clouds hung over the top of nearby Mt. Healy and some of the peaks in the Alaska Range, including Denali, we could see most of the mountain scenery on the way to Tek. It was quite chilly this morning � only in the mid-40s F. when we got up and it was still below 50 F. when we left our site a little before 8. After we got up we took showers, ate some breakfast, checked e-mail and the latest weather report and news, and finished getting the camper ready to move. We stopped at the dump station on the way out of Riley Creek Campground. Because we didn�t know the water situation at Tek, Jim filled the fresh water tank. Then we stopped at the Wilderness Outdoor Center (WAC) for a few minutes to ask more questions about the Tek bus schedule. We left there at 8:20 for our new campground. Two tour buses wait for passengers at WAC; the summit of Mt. 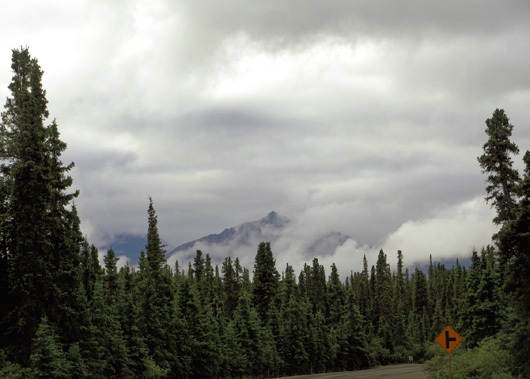 Healy is in the background under clouds. The 29-mile ride hauling our camper from Riley to Tek took us over an hour. Jim also pulled over three times to let cars or buses pass us. There was very little traffic past the visitor center to Tek this morning, with as many vehicles coming out as going in. 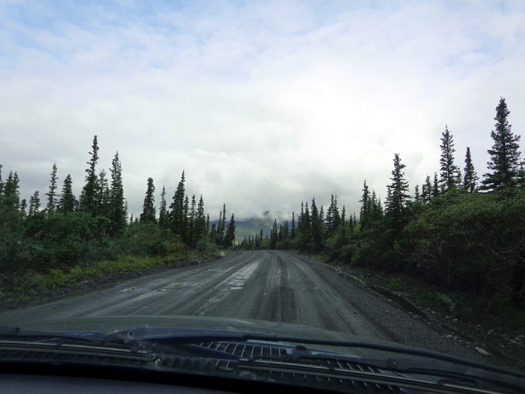 The remaining miles to Kantishna at MP 92 are dirt. We didn�t know what to expect when we got past the pavement � washboard, holes, narrow? Ha! The part of the road we were on in our drive with the camper to Tek and for eight miles past that to MP 37 where Jim rode his bike this afternoon . . . were more smooth than the paved part! 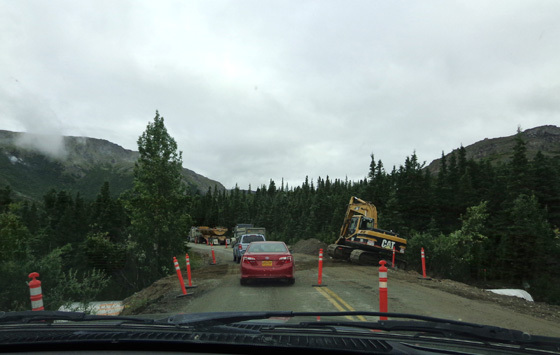 The dirt road isn�t torn up for culvert work, at least where we rode today. 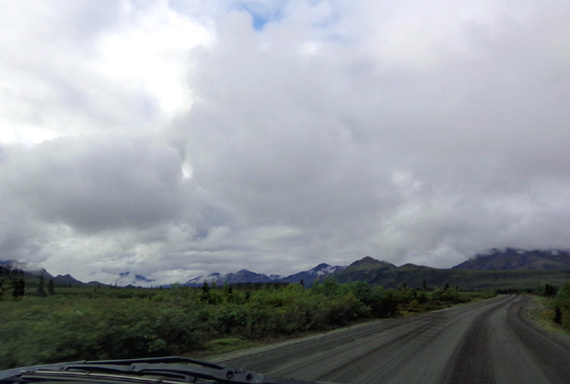 We drove downhill and past the parking area on the near side of the Savage River where we parked several days ago. On the far side of the lengthy bridge across the river a young lady checked to make sure we had a valid road pass to Tek, which we put in our windshield. 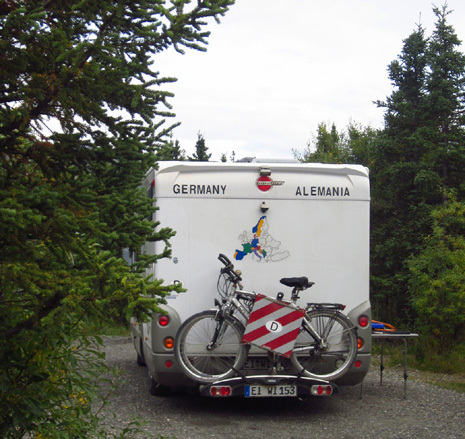 She cheerfully reminded us of all the �rules of the road� and sent us on our merry way. That was good; it meant eight more spots available at Tek. We just hoped some were big enough for the Cameo. No RVs were visible behind us on our way out there so we figured we'd have a few minutes at least to survey the scene before choosing our site. 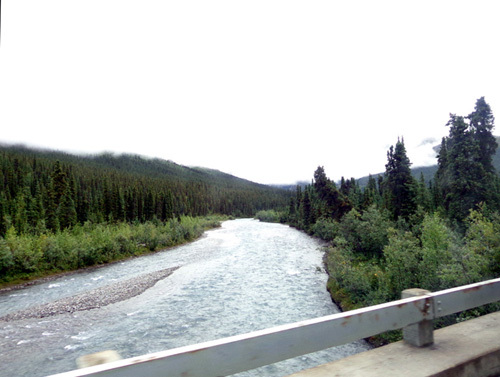 Teklanika River valley; the road parallels the river for several miles, then crosses it. 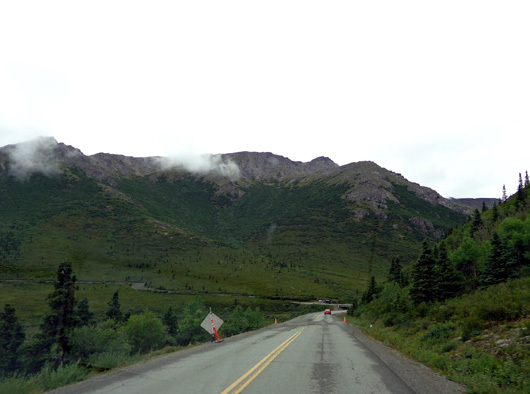 As you can see in those photos, the clouds were fairly low over some of the mountains on either side of the road. They lifted before lunchtime, however, and we had a beautiful sunny afternoon at Tek. 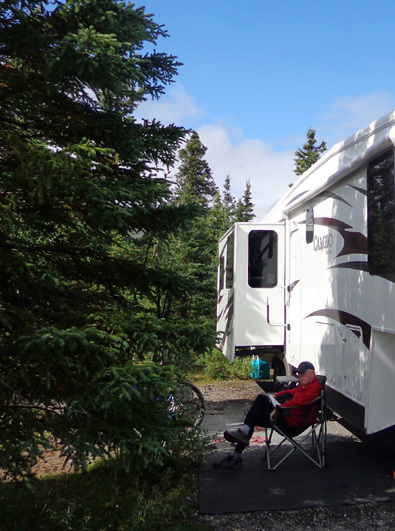 We got out to the campground about 9:45 AM and saw lots of available spaces in the two loops. There are about 55 sites in all and they are first-come, first-served. One of Jim�s main concerns was when the optimal time to arrive would be. Check-in is supposed to start at 11 AM but we learned the hard way at Riley Creek last weekend that folks can come in earlier and claim available spots before 11. We figured arriving at 9 or 10 would allow some folks to leave and if we didn�t find a suitable site already vacated, perhaps others who were scheduled to leave today by 11 would go soon and we could get their spot. That wasn�t a problem today, thankfully. 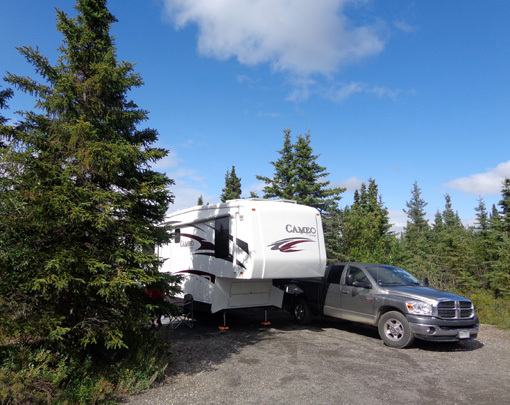 There are no A and B sites at Tek but the range of sizes is comparable to those at Riley Creek Campground � short to long, narrow to wider, some with plenty of maneuvering room and some without. We found three potential sites in the first loop and a couple more in the second loop. The two pull-thrus were kind of tight; one might have worked. Both were empty when we arrived. 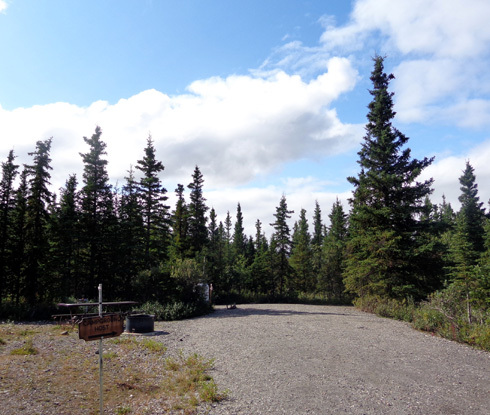 If there had been no sites large enough for us, CJ (the campground host at Riley Creek) had told us to take the campground host site at Tek because it is vacant. 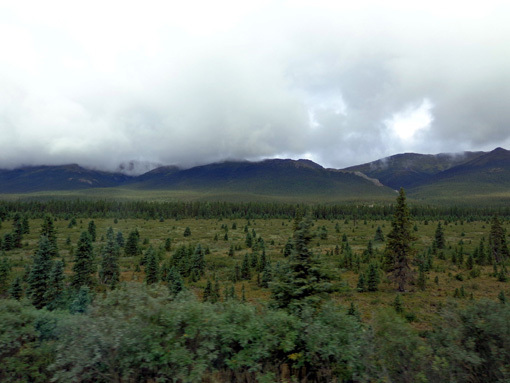 The sites are all well-separated among the spruce and deciduous trees. We�re at a higher altitude here (about 2,600 feet) than at Riley Creek so the vegetation is a little different. The trees are shorter here, too, so we should get more sun on our solar panels. Food storage building (L), restroom (R), and water spigot in front; we're right across the road. 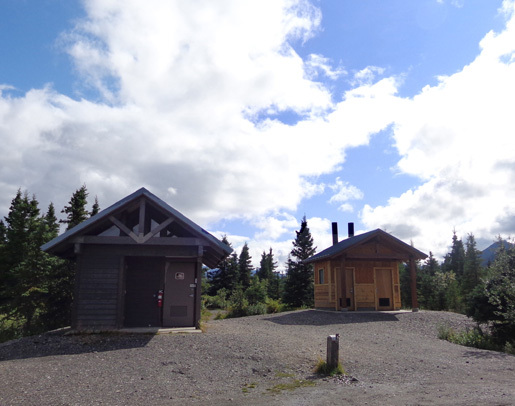 We�ll use that restroom as much as possible, as we did at Riley Creek. Generator hours are as stringent as they were at Riley Creek � 8-10 AM and 4-8 PM. 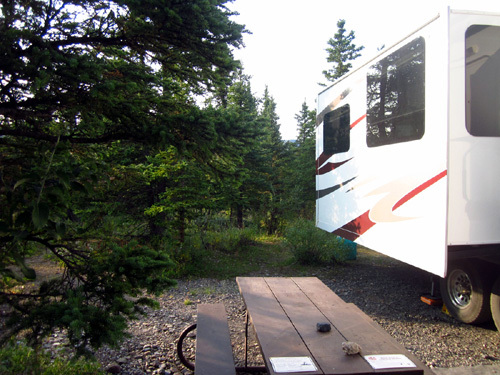 CJ told us one complaint he�s heard from people who�ve camped at Tek is that with no campground host some folks run their generators outside those hours. The vault toilets are even more modern here than at Riley Creek. 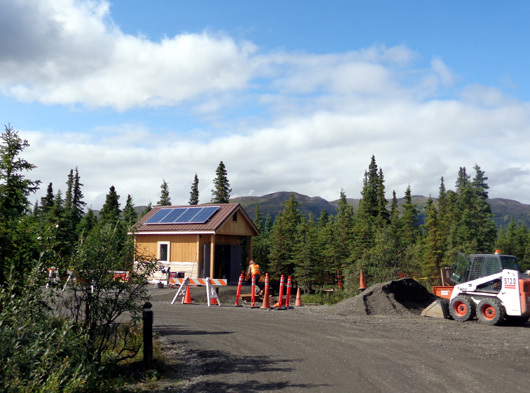 There are two near us and another one with solar panels being constructed at the entrance to the second loop (shown above). It�s a little noisy but we�re far enough away that it doesn�t bother us. 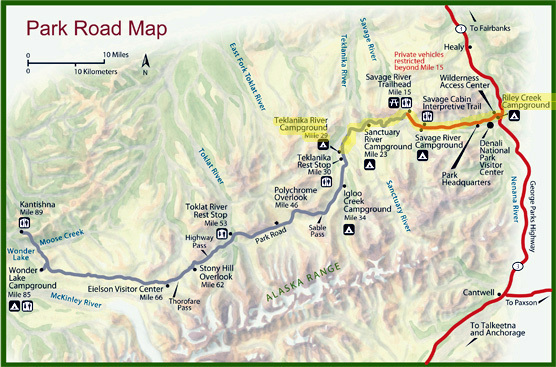 Sites are $16/night, or $8 for those of us with National Park Service senior or other passes. After we got settled in we went out for a walk through the campground with Cody. Within a couple minutes we saw a 50-something woman running toward us. When she smiled I asked her about nearby trails and that began a fruitful discussion about where to hike and what it�s like to take the shuttle buses farther back into the park. Sally was very helpful and we returned the favor by loaning her and her husband Bob two of our water containers so they can put more water into their RV tank. 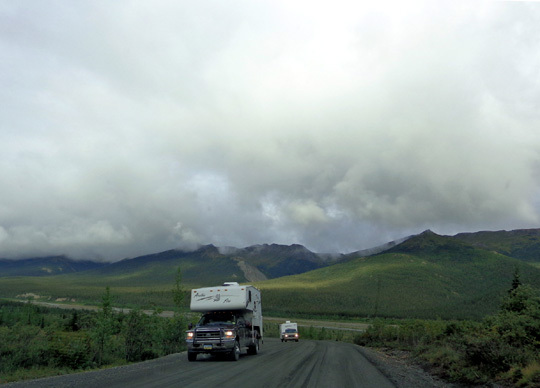 They�re camping for the very first time and rented a little motorhome to tour Alaska. Sally and another fella who walked up (not her husband Bob) told us to follow a particular path to the river (the campground is very close to the Teklanika River) and just go north or south on the wide rocky river bed. The man said the main channel is about knee deep most places. It�s running fast but not high. He also said there was a ridge that was nice to climb to get good views. I think he was talking about the hills on the other side of the river to the west. The guy also said he saw a very large grizzly bear across the river near the campground and some large piles of bear poop. 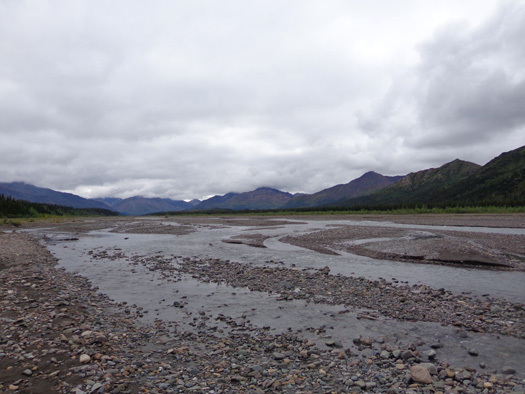 of grizzly bears, moose, caribou, wolves, and other wildlife along the nearby river corridor. Sally and Bob have been here at Tek for three days and are going back to Riley Creek tomorrow. Since we're going on our first bus ride into the park tomorrow we asked them if they've done that yet. They've been out twice, using their Tek passes. They rode the bus out to Wonder Lake one time, hiked around, and caught another bus back. They had to wait about an hour but the first bus they saw had room for them. A group of seven people had to split up at another stop, however. 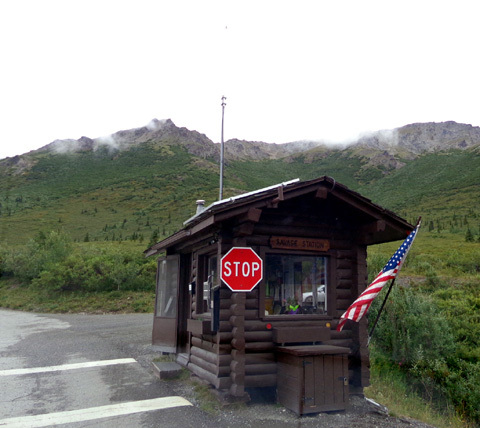 They also went out just to the Eielson Visitor Center once. 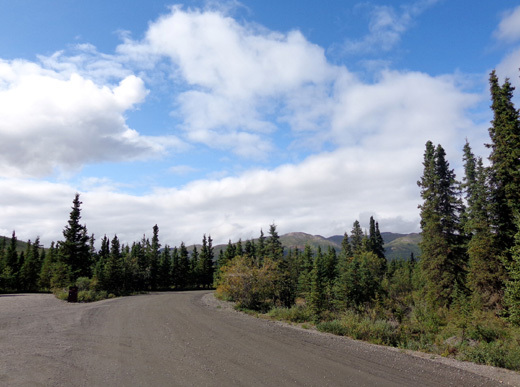 Sally encouraged me to hike at both Wonder Lake and Eilson, which I�ve already planned to do. 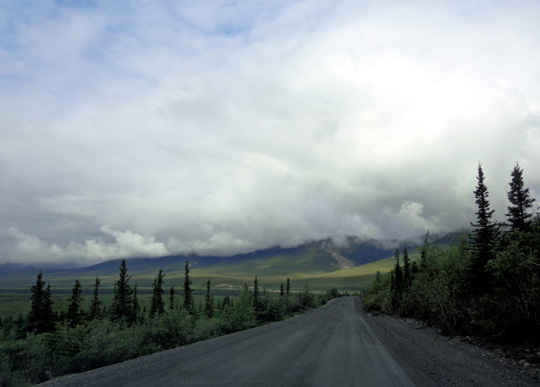 She and Bob saw a large group of caribou crossing the road in front of their shuttle bus on one of their trips. 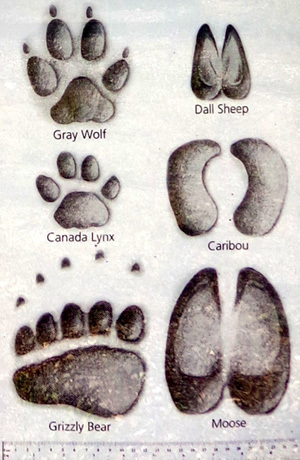 They also saw bears and moose. Jim and I are eager to go on our first bus ride tomorrow. 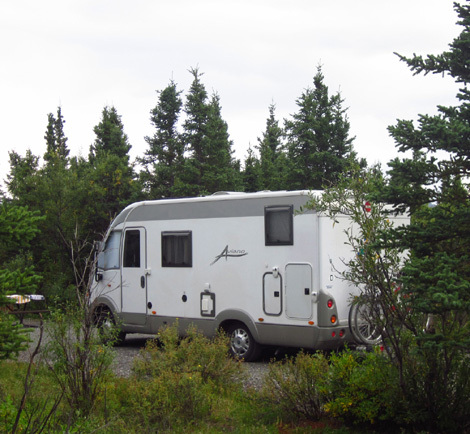 We had bears and moose in our campsite at Anchorage; wonder if we'll get any in this one? 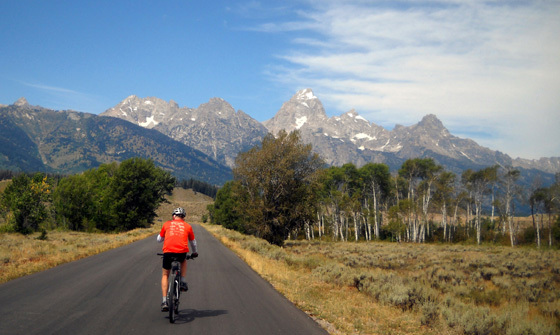 In the afternoon Jim rode his bike farther back the park road and I hiked south along the river. I'll show photos from those mini adventures in the next entry. We had a nice mix of sun and clouds today. When the sun was shining we were both plenty warm, especially while hiking and cycling. When the sun was blocked by clouds, we got chilly just sitting around the campsite. Temperatures are bound to be cooler at Tek than at Riley Creek since the elevation is higher here. The highest outside temperature I saw on our thermometer today was only 59 F. We had the propane heater on a couple times during the late afternoon/evening. Jim ran the generator only for supper prep and about 20 minutes before the 8 PM deadline at night so the batteries would be charged tonight. 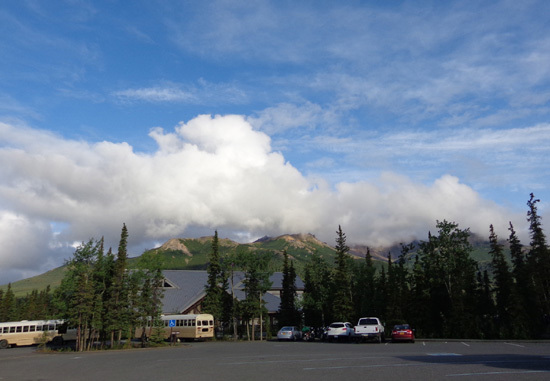 I went to the amphitheater to listen to �Stories From the Summit,� an interesting ranger presentation about two early attempts/exaggerations re: climbing Denali (the Cook and Sour Dough Expeditions). 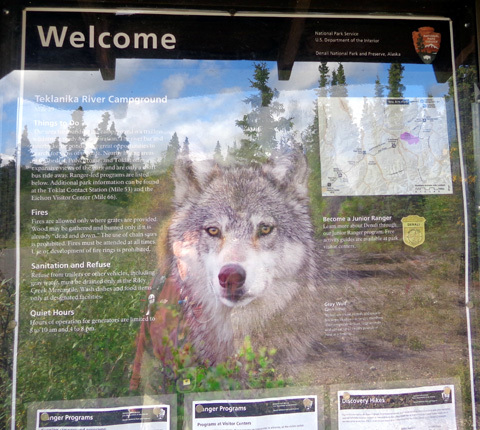 I'd read about the expeditions on interpretive panels along the George Parks Highway through Denali State Park but the narrated version here was more fun. Yes, it was chilly so everyone was bundled up this evening. Apparently all the rangers giving campground talks in the evening have to go over the �BMW� warnings re: bears, moose, and wolves. This one gave almost identical information as the wolf presentation guy at Riley Creek, only this young man used more humor. Both mentioned the futility of bear bells. This guy said they are jokingly referred to as �dinner bells� because grizzlies associate them with hikers who have food in their packs. He said the bells actually attract bears. the "ruler" at the bottom is a disconcerting 23 inches wide. 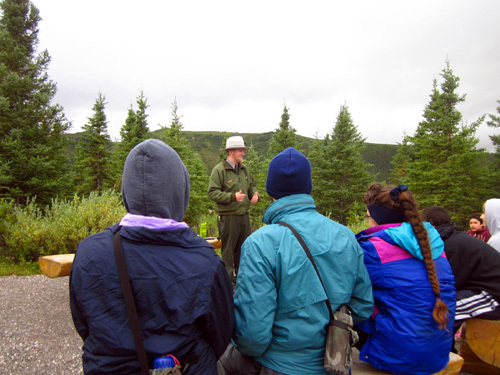 The ranger emphasized that the human voice is most important in letting bears know you�re in their territory so they can leave. He joked that any language will do (there are many foreigners here)! We got to bed early so we'll be rested for our long shuttle bus ride to the far reaches of the park tomorrow. We can go as far as Kantishna at Mile 92 if we want. But first, let's explore a little closer to home . . .